Honestly, If you haven’t heard about this yet, It’s because it involves lesser known NFL player. Yet, I am sure over the next couple of weeks it will make big news. This Saturday night Ted Ginn Jr. hosted what was to be his birthday party in a night club in Cleveland. 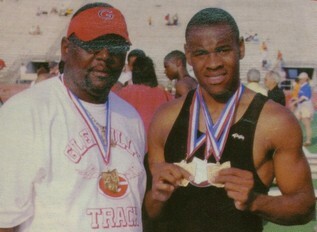 Ted Ginn Jr. on the right was quite the track star in high school! This is nothing out of the ordinary because the Miami WR was born and raised in Ohio right outside of Cleveland, and he has many friends in the area. Now, here is the juicy part. Ted is still friends with alot of his high school football buddies who he played with at Glenville High. 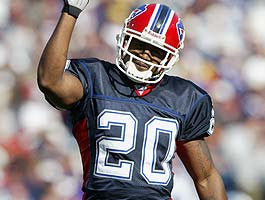 Several players in this group were and are NFL players, including Donte Whitner Safety for the Buffalo Bills. Now, I have no issue with this story up until this point. There is nothing wrong with a player hanging out near his hometown with his old school mates, but you need to realize the where and when. NFL players at a night club, late in the night is a equation that is asking for disaster. Has anyone learned anything, form the tragic events over past 3 years? I mean really considering all the shootings and moronic fights, players should now realize that anywhere you go you are likely to be targeted by a true hater. Some one who wants to throw down or rob you just to say they did it to a celebrity! So back to the story, Donte Whitner at the Party at around 3:00 am had gotten into an altercation with some one at the club, and a pretty big brawl had broken out. Off Duty police officers who were at the club, attempted to slow down Whitner, then Whitner decided to push them off and continue fighting, which is where the story begins to get really bad. Soon, on-duty Police officers arrive at the scene and what does Donte do? He tries to square off with them, and then in doing so, gets tazered! That is just flat out stupid. Ted Ginn Jr. first should have known better than to have his party at a public club. But if you do plan on doing that, Ginn should have made sure that the party was secluded in a PRIVATE ROOM, that has it’s own bar, separate entrance and of course security . Darrent Williams death should be a reminder that people target players, late night near or in clubs. Players need to be smarter than this, you are not a regular person and you are a target for the idiot haters, who want to brag that they beat up, robbed, or killed a NFL player. Donte Whitner gets no sympathy from me, especially considering he attempted to square up and “fight a police officer”. That is just stupid. He not only has made himself look foolish but he is making it 10 times harder for the League, which has be fighting the idea that many of it’s players are criminals. We have all heard the issues surrounding Pacman, Tank, Ray Lewis, Jamal Lewis and the many others that have had legal issues in the last 20 years. The NFL should start being more proactive about this problem. If you act like a jerk in society than you have no business being employed by the NFL. Roger Goodell it is time to be stern and protect the game and help save the player! Do the right thing. Actions like this should not be associated with the NFL, but sadly enough they are due to players like this. I personally believe that Donte Whitner should be suspended without a doubt from the NFL. Actions like this are not acceptable, and any other course of action would just be a slap on the wrist. NFL players can not act like this, not for the children’s sake, and not for the fan’s sake, but for the sake of the game. Donte Whitner’s teammate Marshawn Lynch was the driver in a hit-and-run incident last summer but escaped with only a traffic ticket. This type of behavior needs to end, especially out of buffalo bills players. These players need to be held accountable just like everyone else. I know players mess up, but come on man! Who doesn’t! If you haven’t heard of Dante Whitner until now, I am sure you won’t forget his name. Moronic actions can sometimes spark a players popularity and that’s just terrible thought. We are always looking for the player we can fix, and I think that is just dumb, because we are breeding and fostering this type of behavior. I am sick of news like this. Players have a tremendous gift and it is nothing short of a waste to act like this soiling the good name of the people who have not only come before you but also after you. Listen Donte Whitner to what I have to say! In closing I just want to say one thing to all NFL players, “after 1 am STAY OUT AND AWAY FROM THE CLUBS!” Just get a really nice vacation house or something!